Darwin is renowned for its sunsets, laid back, tropical lifestyle, crocodiles, outdoor dry season functions and the multicultural Mindil Beach Sunset Markets. What better way to enjoy a glorious Darwin event than with a photo booth and some funky props! It’s our pleasure to provide a premium Darwin photobooth hire service throughout this incredible part of Australia. We are true Territorians born and bred! Our commitment is to surpassing the “NT” attitude (not today, not tomorrow), and we are dedicated to offering the best photo booth hire in Darwin, whether it be for a wedding, party, school or corporate events, or a gala ball under the stars. Ours is the Darwin photo booth experience that won’t be forgotten! Hi we are Amy and Andrew from ‘In The Booth’ photo booth hire Darwin! Yes, that’s right! In the Booth has made it to the Northern Territory. We first saw In the Booth in 2014 at a friend’s wedding on the Gold Coast, it was some serious fun and the life of the party (not forgetting about the gorgeous bride and groom of course). We love that we can bring so much enjoyment to people and their special events with our photo booth hire, and can guarantee there will be plenty of laughs and memories. When we aren’t boothing chances are we will be out enjoying our tropical lifestyle, watching the footy and spending time with our boys Corey and Jake. 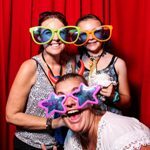 We look forward to you booking a photo booth in Darwin with us and letting us make your event one that your guests will rave about! If you’re planning an event in or around Darwin, please get in touch! To arrange Darwin photo booth hire, send us an enquiry. "Hey Amy, Just wanted to say a massive thank you for your professionalism throughout our wedding. The finished product is amazing and I'm very excited to go home from work today and look at all of the funny photos! It is an amazing booth! Thanks again- I'll be recommending you to everyone! " "On behalf of all the DonateLife team, I would like to thank you for your fantastic ‘In the Booth’ stall with us at the Mindil Beach Sunset Markets for the Launch of DonateLife week on Sunday August 2nd. We all had a ball and your wonderful hospitality was very much appreciated. We had a lot of laughs and really enjoyed the evening. In fact our office is now adorned with photos from the booth! Thanks again and take care,"
"Thanks Amy, I received the box & card - lovely touches. It was a pleasure meeting you, thank-you. Wishing you the greatest success & joy with your business. 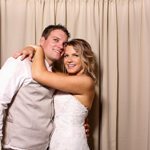 Kind regards,"
What is it you love about providing photo booth hire services in Darwin? The fun and (mis)behaviour in our photo booths matches the Darwin lifestyle perfectly. A little bit cheeky, a little bit mischievous, a lot of personality and a whole lot of fun! The laid back and relaxed vibe of Darwin translates beautifully into the diverse venues we have here, all of which are designed to take in the best views the Northern Territory has to offer, whether they be ocean, rainforest or wetland. We love celebrating our culture and environment and what better way to do that than by providing photo booth hire to all of Darwin’s best events and venues! Tell us about some uniquely Darwin touches you would love to see at an event? Is all this stuff (person points to the guest book, USB pack, and props) included and do I get an attendant for the night? We are thrilled to be able to reply that yes, our Darwin photo booth hire packages are all inclusive and that our attendants will be on hand to ensure that your guests and yourselves will have the most amazing photo booth experience ever! Just roll with it and have fun! 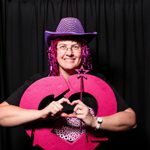 Having a photo booth at your event is a great way to get your guests to loosen up, and with our awesome attendants there to help it all run smoothly, you won’t need to worry about a thing. Experience the sunset while wandering around the Mindil Beach Sunset Markets. Visit Nightcliff Foreshore to take in some of our rich history and get out into the wetlands of Kakadu and Litchfield National Park to witness some of the most wild and breathtaking waterfalls and gorges the world has to offer. Don’t forget to watch out for those crocodiles and grab yourself a cold beer as it is so incredibly hot all the time!